A while back I acquired this DVD-ROM collection of ever Star Trek comics published between 1967 and 2002 and I'll pick through it it every now and then. In the past year I started chipping away at DC's first (1984-1988) series, and in the wake of Leonard Nimoy's passing I've started really powering through the issues I have remaining. I'm enjoying the hell out of it, and there's an argument to be made that not only is this the best Trek comic ever published, but it's one of the best licensed comics series of any franchise ever, produced by any publisher ever. Licensed books can be tricky, because even when they're good, they rarely feel groundbreaking because the licensee needs to keep the licensor happy at all times, and the latter usually (and understandably) has a long list of requirements that need to be met so that the comics produced resemble the original product. This is why a licensed title like, say, Doctor Who may occasionally be pretty good, but books like Silver Surfer or Ivar, Timewalker end up being much better Doctor Who stories. 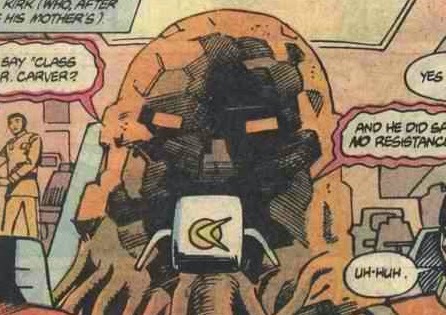 The creators of these comics have more freedom to explore concepts in greater depth and/or with greater consequences, while the actual Doctor Who writers have to turn in something that closely resembles the show's weekly continuity. The '84-'88 Star Trek has some of these limitations, of course, as it begins just prior to the release of The Search for Spock and quickly has to make allowances for the plot points introduced in the course of that film. A similar course correction happens as the writers have to tie up plotlines concoct a way to get the main cast back on Vulcan just prior to the release of The Voyage Home (this is the point I'm at now in my reading). In between, though, you have a book brimming with creative energy, one that takes the familiar aspects of the franchise and the situations they had been left in by the films and takes them in interesting directions. No Enterprise? No problem! 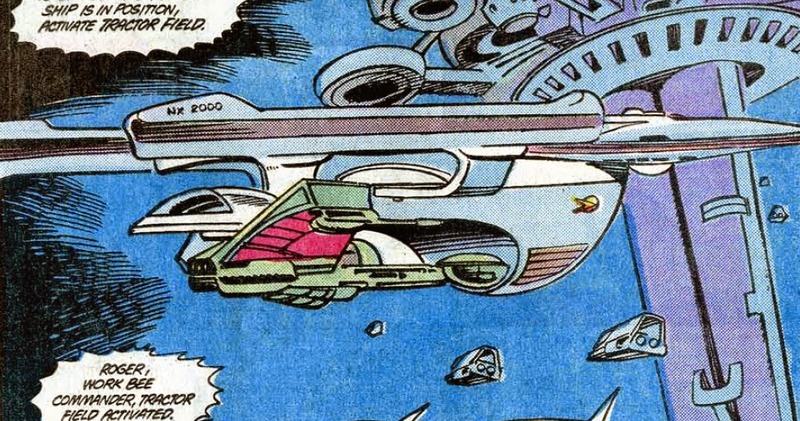 Kirk and crew earn their way back into Starfleet's good graces (barely, and thanks in large part to the help of an Andorian journalist) and is re-assigned to Excelsior for a long shakedown cruise, earning enmity from and making a foil of Captain Styles, Excelsior's previous, pompous captain seen in TSoS. Spock has been revived, but they can't really use him much for fear of not knowing what the plans for him were in TVH, so he gets his mind back and is promptly given a science vessel of his own (and the occasional guest shot). But Saavik has been waiting in the wings since Wrath of Khan, so she slides into the Science Officer spot, gets a lot more backstory, and becomes our "outside observer of the human condition" character. These are the voyages of the starship... wait, come again? Speaking of character development, that's where this book really sings. We get a good amount of time with each of the main cast (everyone gets a spotlight issue sooner or later... Diane Duane's issue focusing on Dr. McCoy is the best of the bunch), and they get fleshed out as much as they can, but things really pick up with this series' original characters, such as: Konom, the Klingon who objects to his people's violent natures and defects to the Federation; Nancy Bryce, an ensign whose father was killed by the Klingons, and she is forced to confront those feelings as she falls for Konom; and Bearclaw, a Native American initially bigoted against pretty much any other species or person he encounters. And then they go a step further by filling out the cast even more with extra-canonical fans may recognize, like Arex and M'ress from the Filmation cartoon series, or Naraht, an upbeat and earnest young Horta serving in the science division, who originally appeared in the novels. Storywise, it's as much of a mix as the TV show ever was, very true to the original series's anthology nature. There are big sweeping epics and smaller personal tales, deadly serious stories and comedic yarns... it runs the gamut. Not every issue is a masterpiece, but it hits more often than it misses. My favorites so far have been The Mirror Universe Saga (#s 9-16, and later collected in a trade paperback), a sequel to the TOS episode "Mirror, Mirror" and Double Blind (#s 24 & 25), a comedic story in which two races try to hijack Excelsior, neither being as powerful or competent as they present themselves. 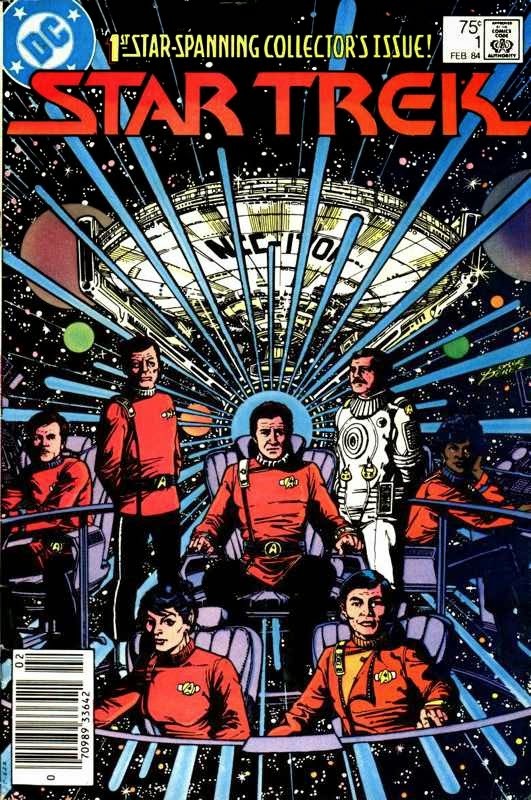 It's also worth checking out Annual #1, telling the first adventure of Kirk's crew as they take over from Captain Pike's, and Annual #2, which depicts the final story of the TOS Five Year Mission and the transition over to things as depicted in The Motion Picture. They make nice bookend stories. Based on everything I've read, this volume finally came to an end and was relaunched because the suits at Paramount wanted less focus on the original characters and more on the traditional cast. 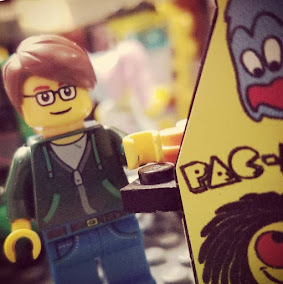 More's the pity, because it is the comics-specific content that bristles with creative energy and makes it stand out among the crowd of overly "safe" licensed material. I'm looking forward to reading that next series, too, mind you, the Peter David-penned stuff in particular, but I'll miss this iteration. If it's wrong to love having a Horta on the crew, then I don't wanna be right. Naraht is awesome, you guys.